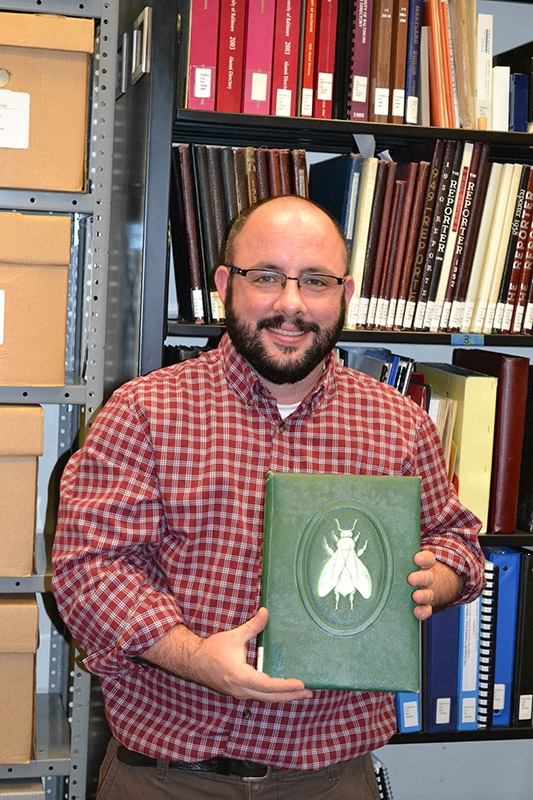 Special collections brings buried history back to life. What’s unique, one-of-a-kind, or rare at UB’s Langsdale Library? Copies of The UB Post from the 1970s are few-and-far-between, but you can find them at the Langsdale. A large collection of jazz records. There are written records of the “road fights,” during which citizens, preservationists and environmentalists, starting in 1968, fought an expressway planned to run through the Inner Harbor and Fells Point, which threatened to completely destroy the area’s walkability. Unlike some other cities in similar situations, according to archivist Aiden Faust, Baltimore prevailed with local grassroots organizing and managed to stop the highway construction, but not before it damaged several neighborhoods. There are interviews with local residents, conducted by UB students, to fill in historical gaps in the written record which often occurred when events involved underrepresented ethnic groups and neighborhoods. There is television footage of the Baltimore riots. The Gay, Lesbian, Bisexual, Transgender Community Center of Baltimore and Central Maryland (GLCCB) records from the 1990s have recently found a home at the Langsdale Library. And what do all these gifts from the past have in common? All of them are from the last century and all of them are part of over 125 archival collections that comprise the library’s Special Collections. Students and community members can view some of these collections by making an appointment from the Langsdale Library Special Collections website. Other collections are available online. Eighty videos from Baltimore’s earliest TV news stations, WMAR and WJZ, are up on the Special Collections website, Audiovisual Archivist Siobhan Hagan said. There have been 5,000 downloads so far. Library patrons can freely download, remix, and reuse any of these videos as long as it’s for educational purposes. Hagan uses a towering video digitization rack, which she refers to as Buffy the Video Slayer, to convert historical television news shows into digital format. A high- quality motion picture film scanner would help her digitize an additional 4,000 reels of 16 mm film, making years of history accessible to students and the public. One of Hagan’s favorite videos contains WMAR footage of Nancy Pelosi as a little girl at the Baltimore mayoral inauguration of her father Thomas D’alesandro Jr., in the 1950s. Faust’s favorite collections include Baltimore grassroots movements like the road fights of the late ’60s and early ’70s, and the Baltimore Recycling Coalition’s fight against a city incinerator in the ’90s. Faust also likes the oral histories. He is excited that UB students become part of the historical record when they conduct interviews for such projects. Such was the case for Dr. Betsy Nix’s class when students talked with doctors involved in the People’s Free Medical Clinic, founded in the 1970s. The clinic was founded by feminists and members of the Black Panthers to provide free health care for city residents. Much of our Special Collections contain relatively recent Baltimore social history, says Faust, which differentiates it from many other libraries’ Special Collections that focus on much older documents. “A lot of people expect really old books under piles of dust,” he said. But everything in Langsdale Library’s Special Collections is from the twentieth century, just like Buffy the Video Slayer. Dec. 1 through Dec. 4, 8 a.m to 6 p.m.